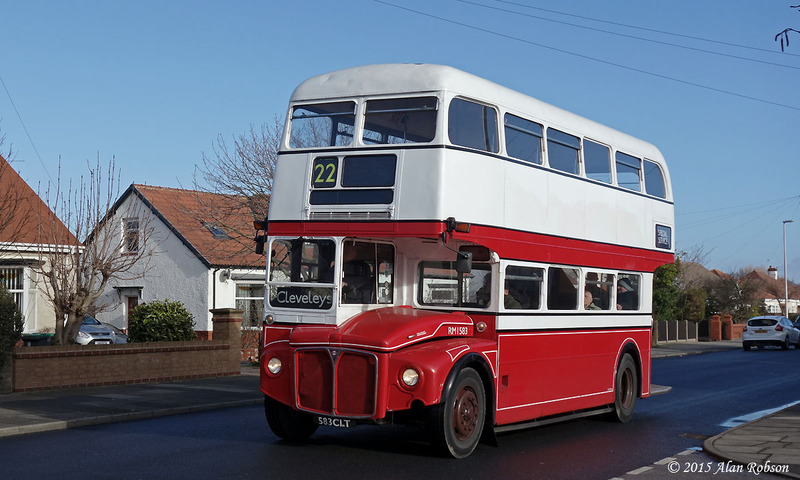 Catch22Bus's other AEC Routemaster was in use on the service 22 to Cleveleys on 30th January. 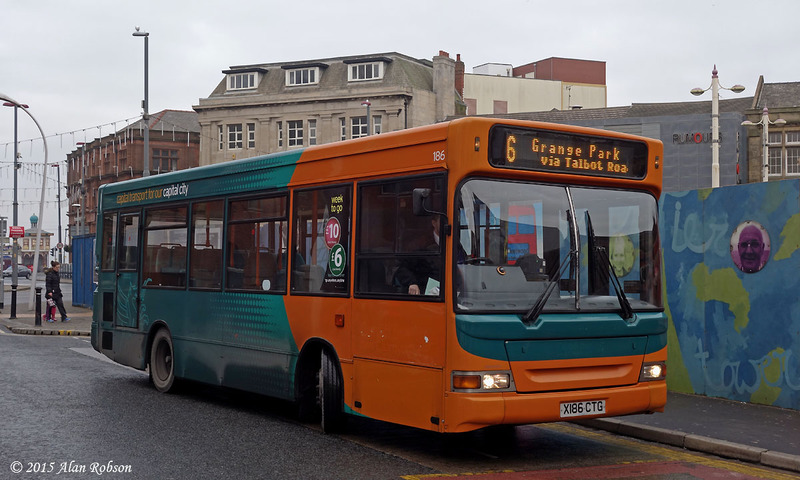 Former RM1583 (583 CLT) was being used in passenger service, this bus having previously been Blackpool 521 in a former existence. 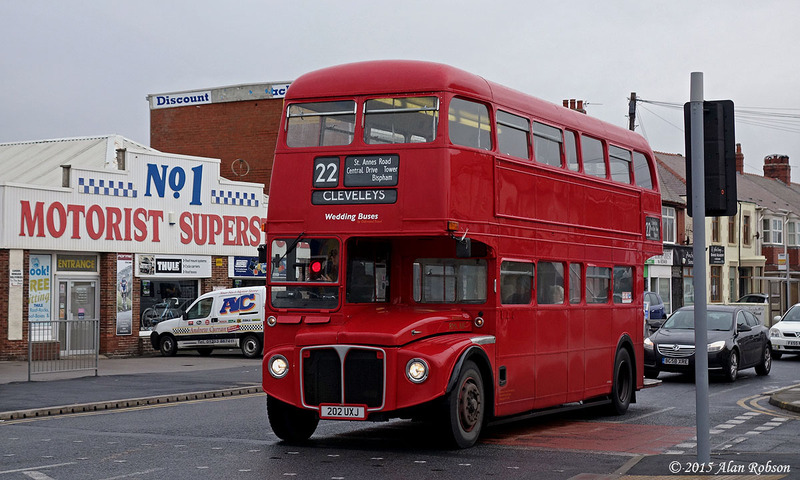 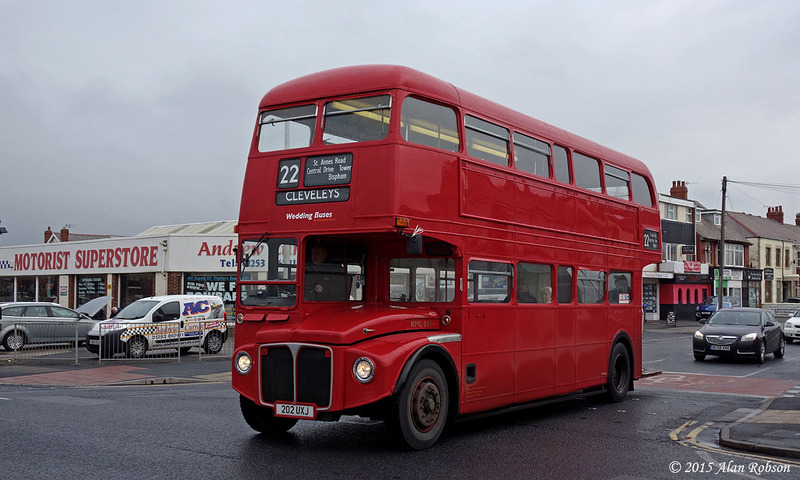 It had been planned to repaint RM1583 into London Transport red again to make it more attractive to clients for wedding private hire use, but currently the bus is still wearing its former Blackpool Transport Routemaster style livery, minus fleet numbers. 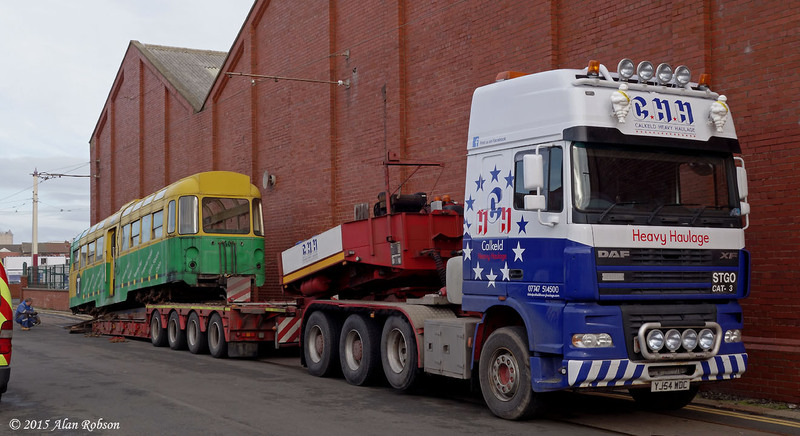 On the morning of 26th January a low loader from Calkeld Heavy Haulage arrived at Jackson's yard in Marton to collect trailer towing car 671 to transport it the short distance to Rigby Road depot. 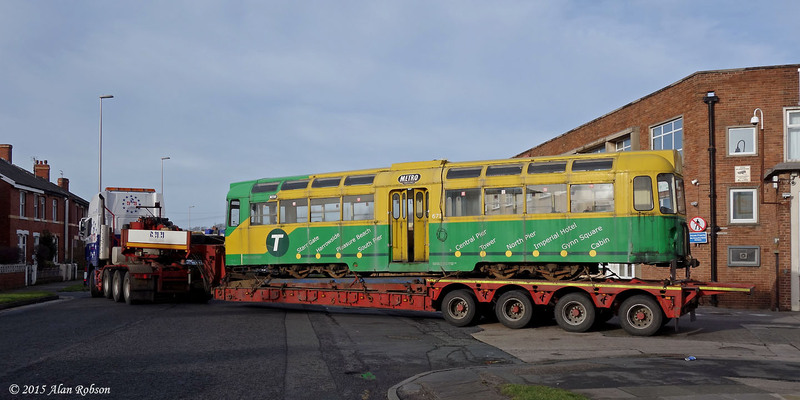 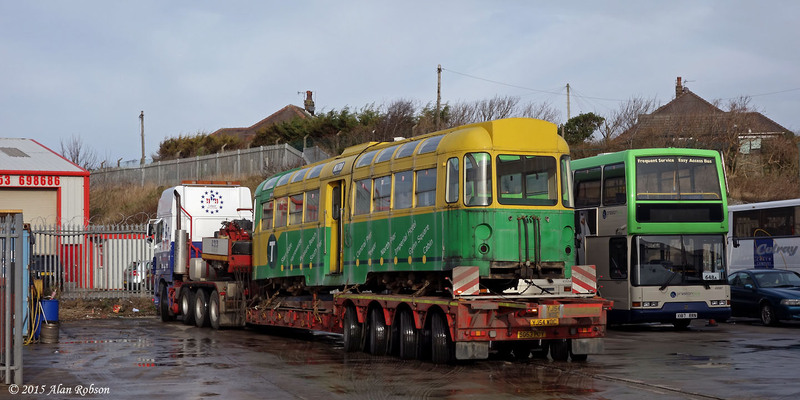 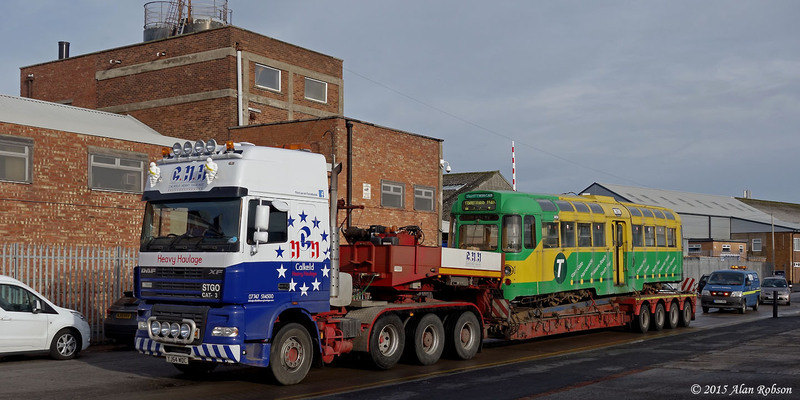 671 had resided in the open at Marton for three years, since Scotts Heavy Haulage first moved the tram there in February 2012. 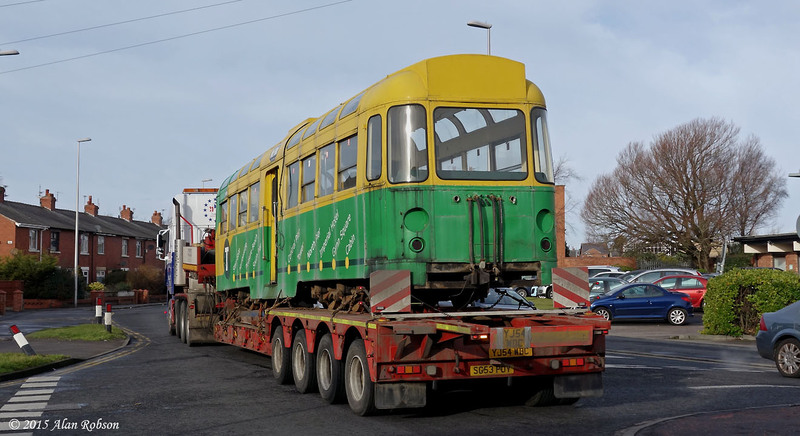 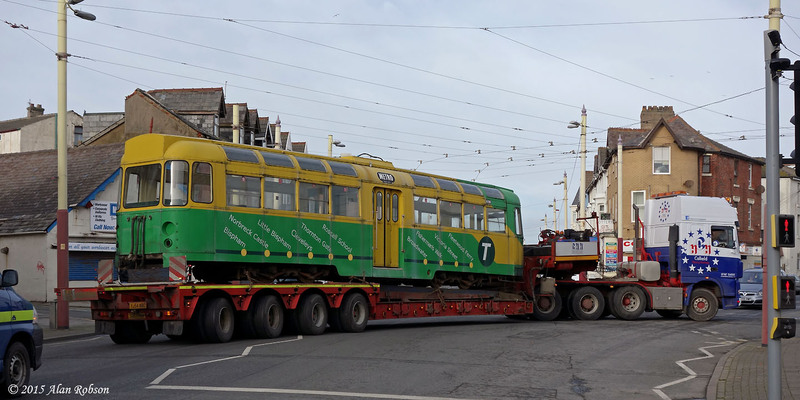 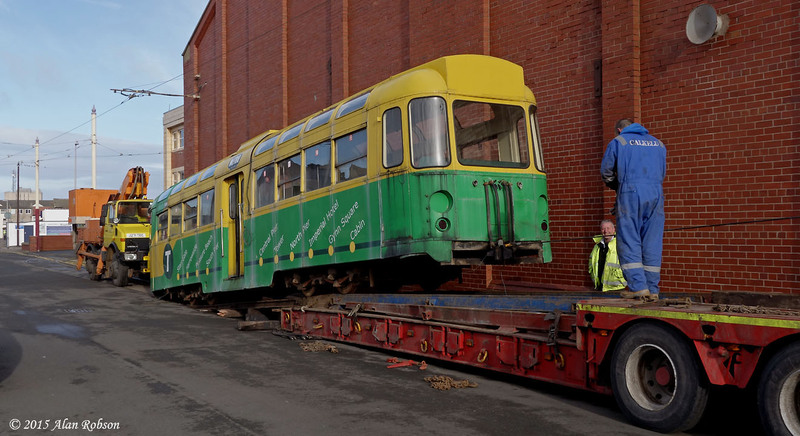 This now means that all the former Lancastrian Transport Trust trams have found new homes again. 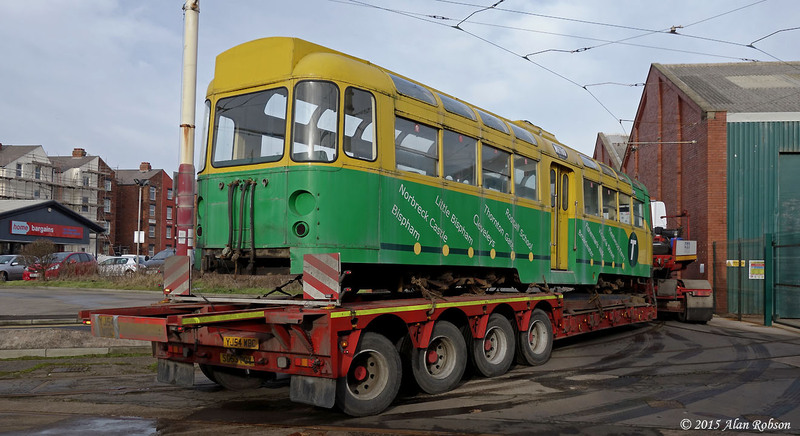 The primary reason for the return of 671 is so that its leaf sprung bogies can be used under 279, to help in the recreation of an English Electric Railcoach, 279 is currently sitting on inauthentic rubber sprung Metalastik bogies from an OMO car. 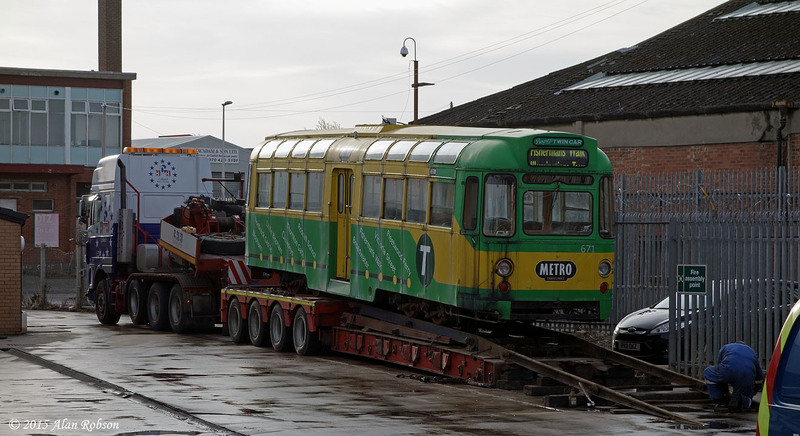 Calkeld handled the move with great efficiency, the whole operation taking less than 3 hours from start to finish. 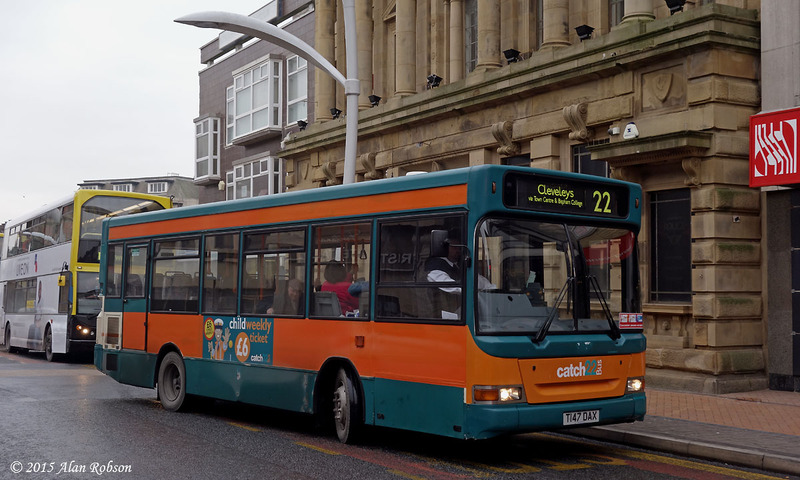 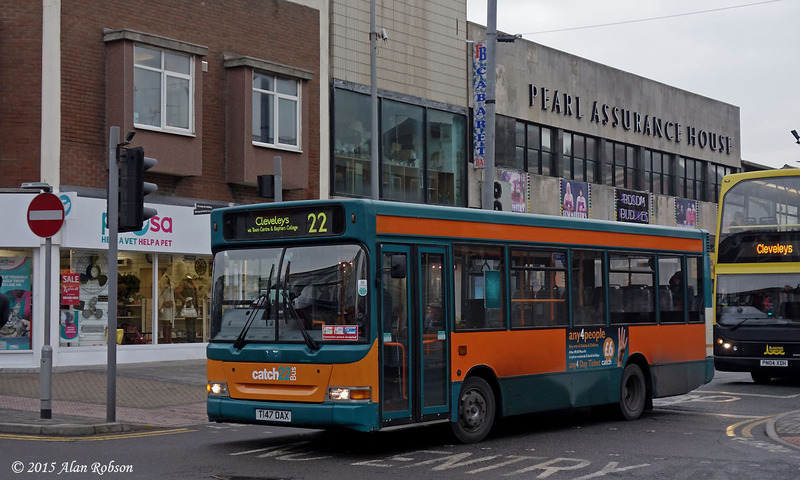 Two former Cardiff Bus Plaxton Mini Pointer Darts have recently entered service with Catch22Bus Ltd. 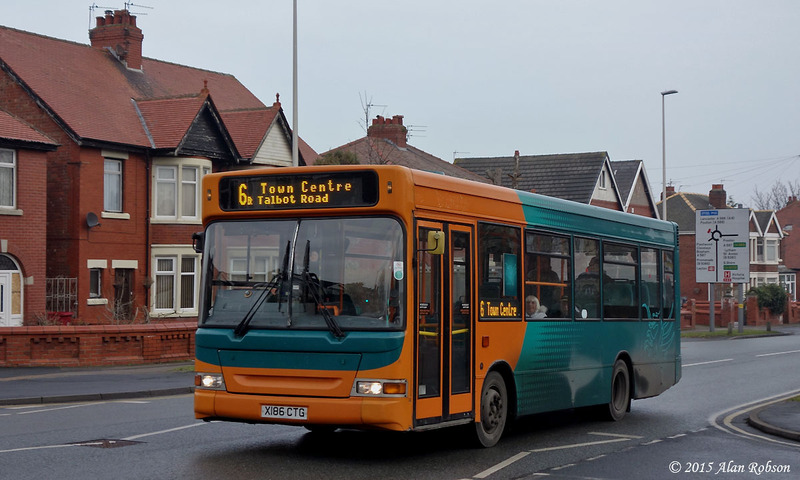 The vehicles concerned are 1999 built Dennis MPD T147 DAX and 2000 built X186 CTG, both buses entering service in their Cardiff liveries, although 147 has had orange vinyl applied above and below the windows first. 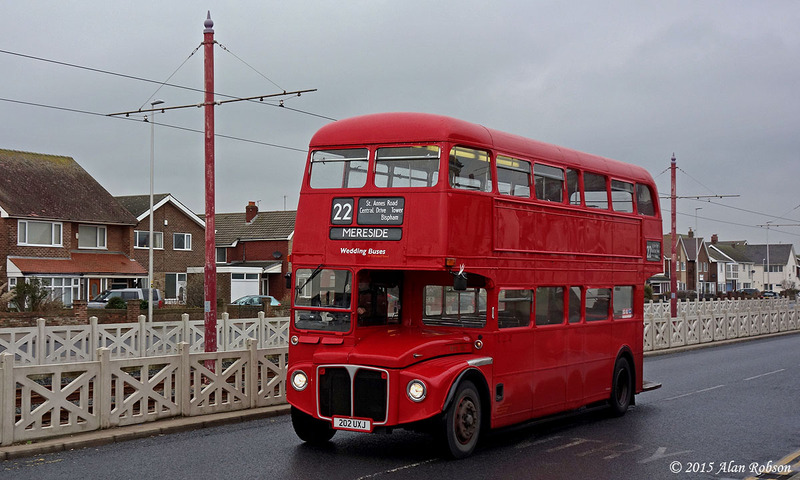 Former London Transport Routemaster RML887 was spotted in use doing a bit of stage carriage work on the Catch 22 service in Cleveleys on the afternoon of 21st January. 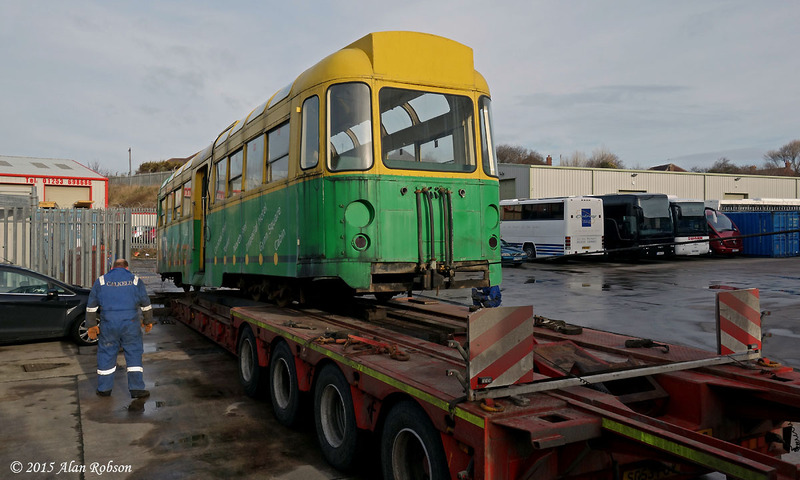 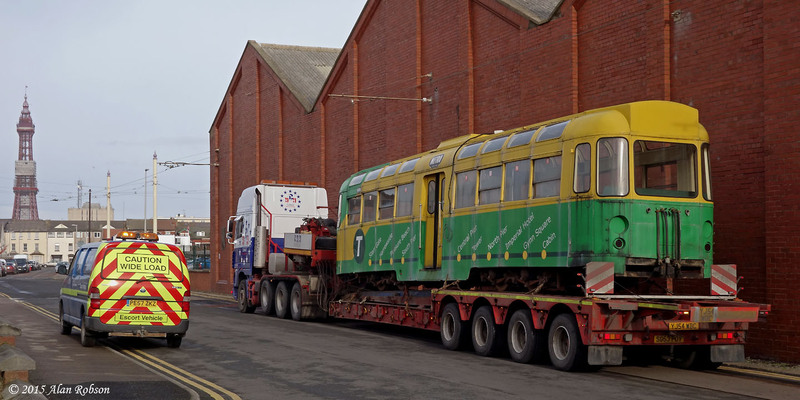 Former Lancastrian Transport Trust Balloon 715 has been moved into the workshops for an assessment of the amount of work that will be required to return the tram to use this year. 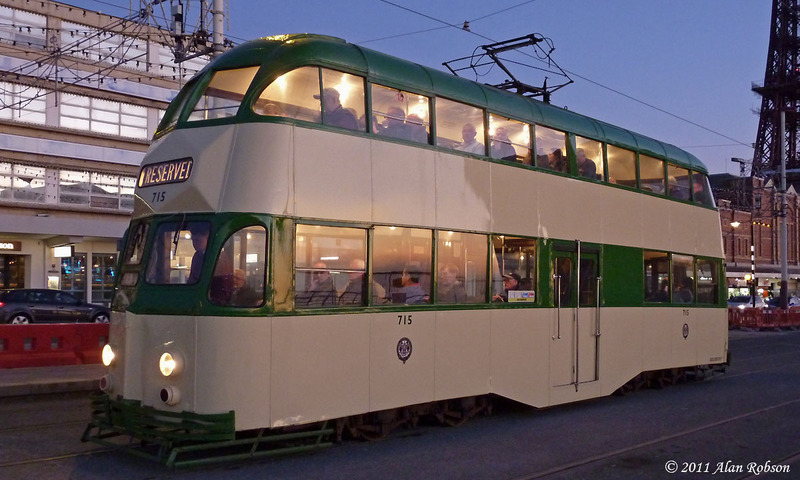 It has been determined that it will be feasible to return 715 to active heritage service without too much travail. 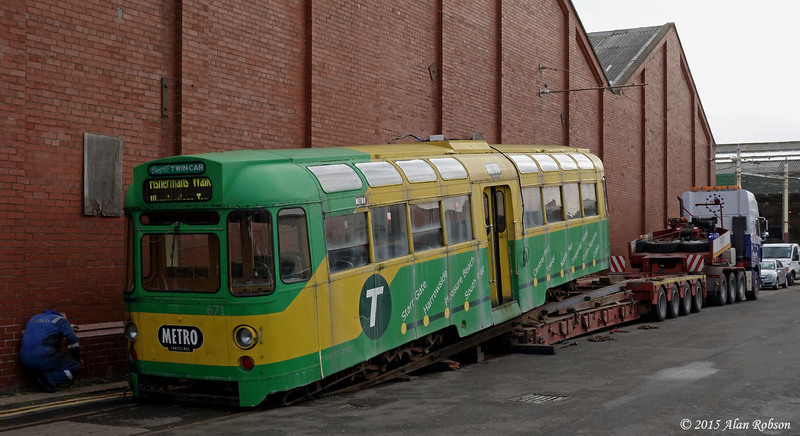 Some of the more obvious rectifications required will be to the broken windows, panelling and some attention to the paintwork (possibly a repaint), all suffered as a consequence of its outdoor storage in Marton. 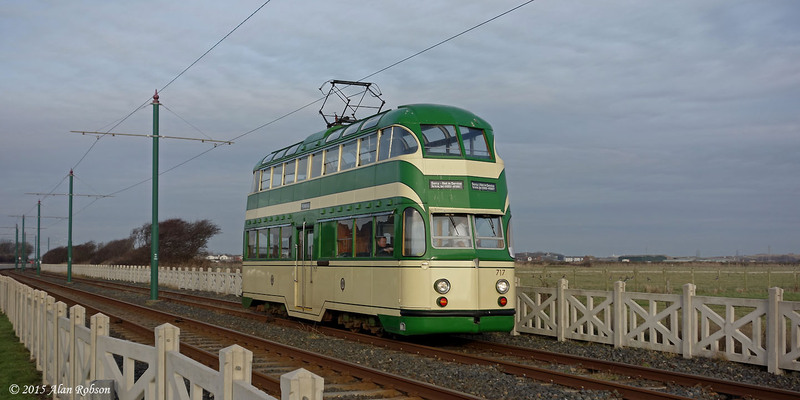 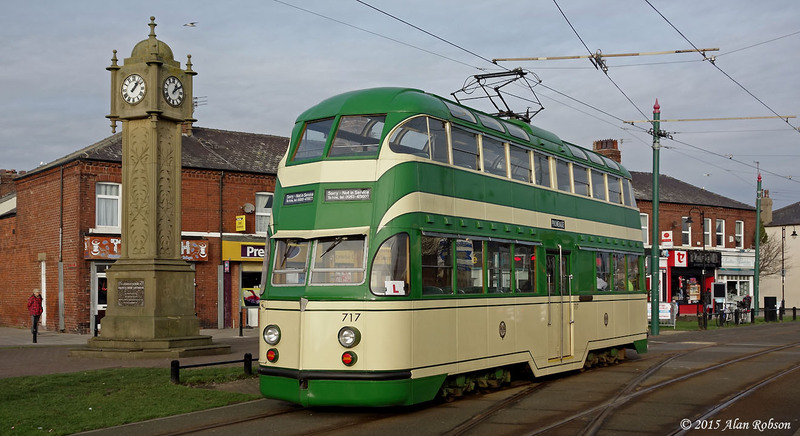 With 715's return to use it will be possible at last to ride on a traditional Balloon in heritage service, as 701's body was modernised and 717 is really a modern interpretation of what a Balloon would have looked like, but in reality the tram was heavily modified during the course of its rebuild into 1930s appearance. 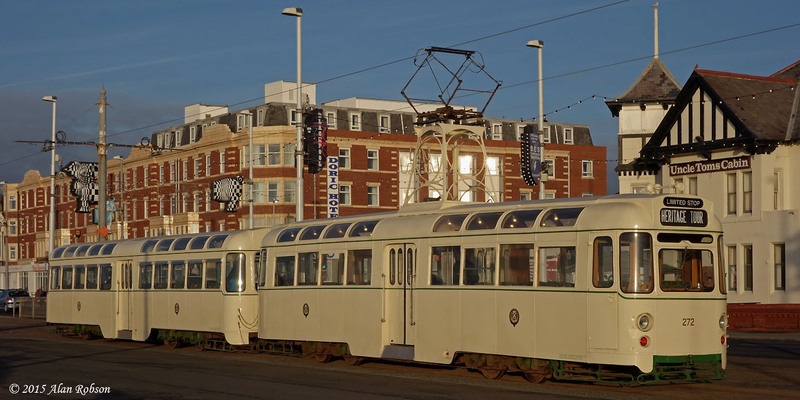 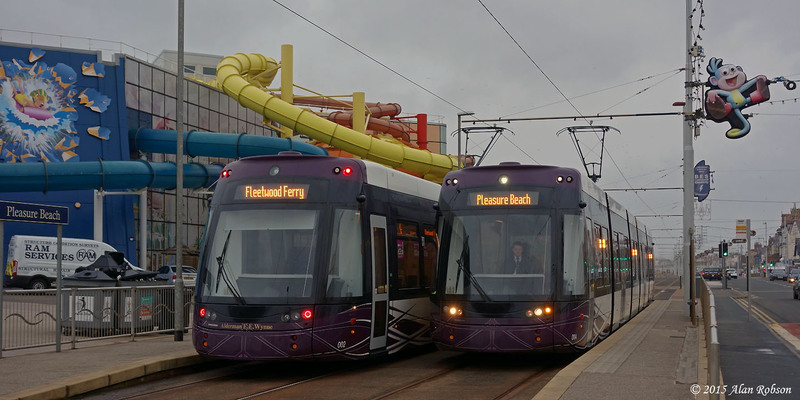 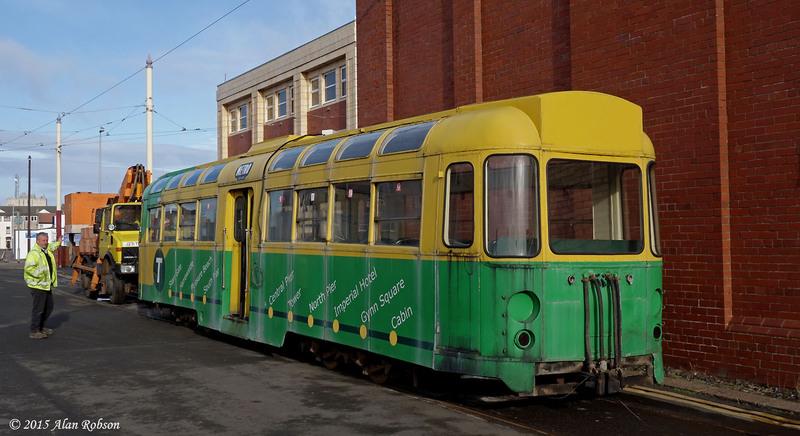 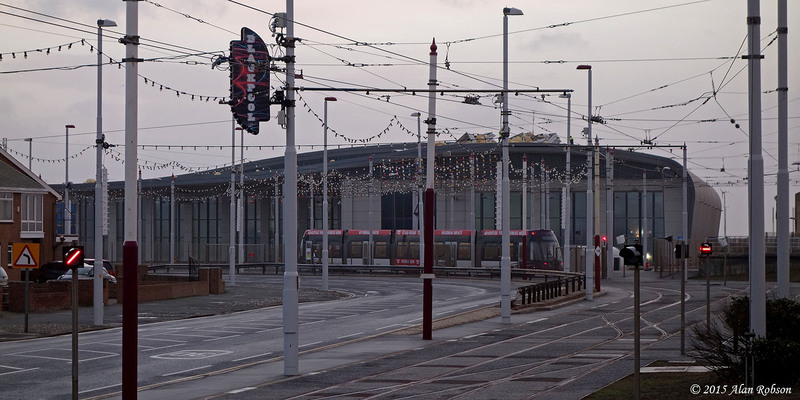 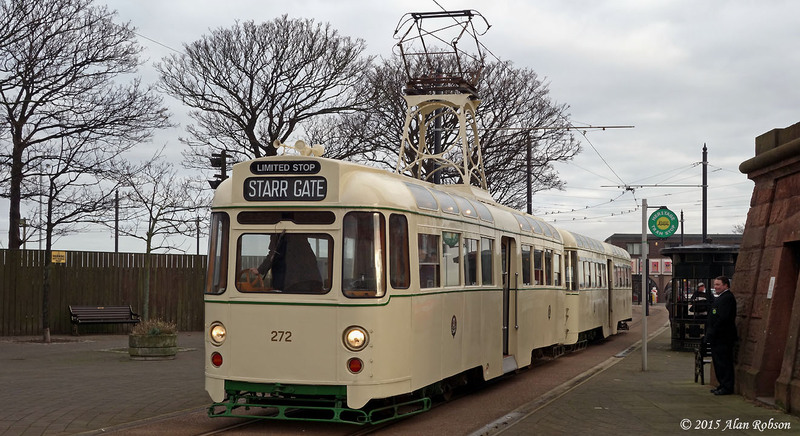 Due to the wind damage that was inflicted to the roof of Starr Gate tram depot on the morning of Saturday 10th January, the tram service was truncated at the Pleasure Beach until the loose panels on the roof of the tram depot could be secured. 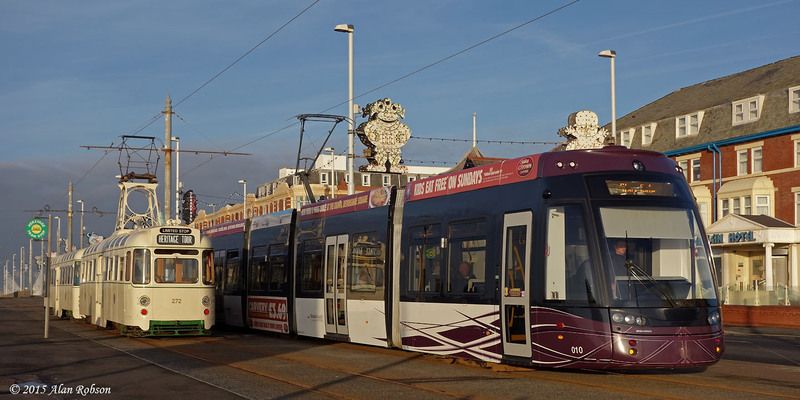 Southbound trams layed over on the Pleasure Beach turning circle before running round to the northbound stop as departure time approached, not that there are many people around at this time of the year on a wind swept promenade next to the closed Pleasure Beach. 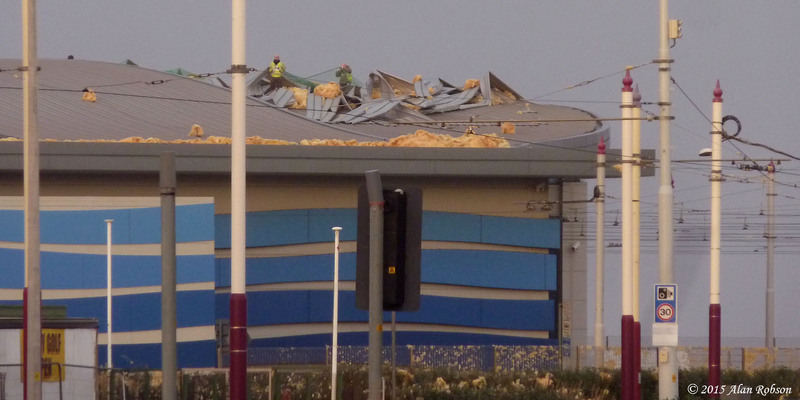 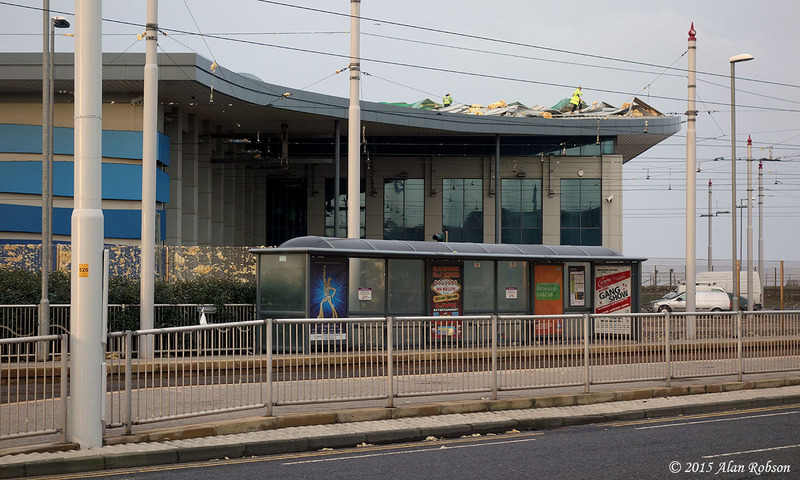 A gust off wind lifted the roof cladding off part of the new tram depot at Starr Gate on the morning of 10th January. 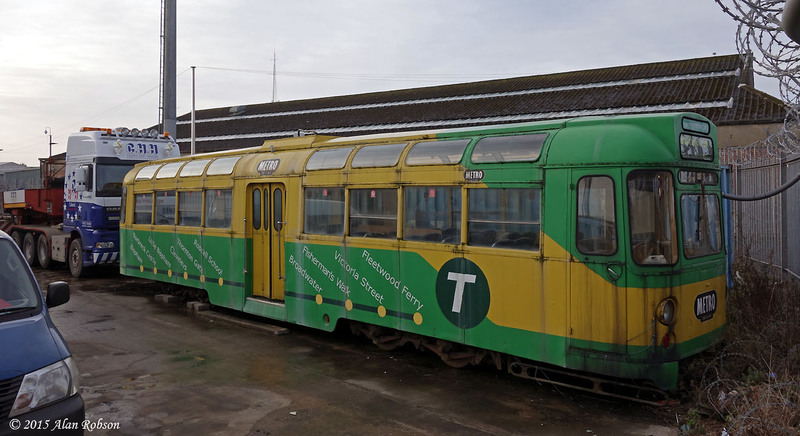 Although the weather on Saturday morning was nothing exceptional, just a reasonably strong wind, a sudden gust lifted several roof sheets from over the engineering bay and office side of the depot. 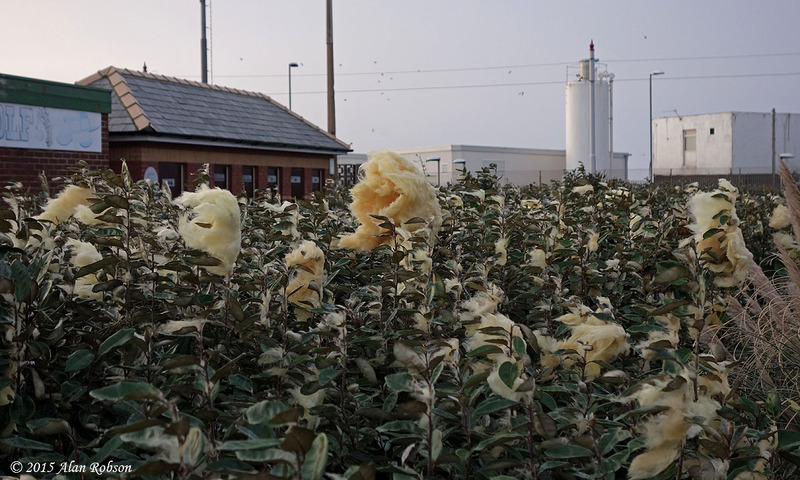 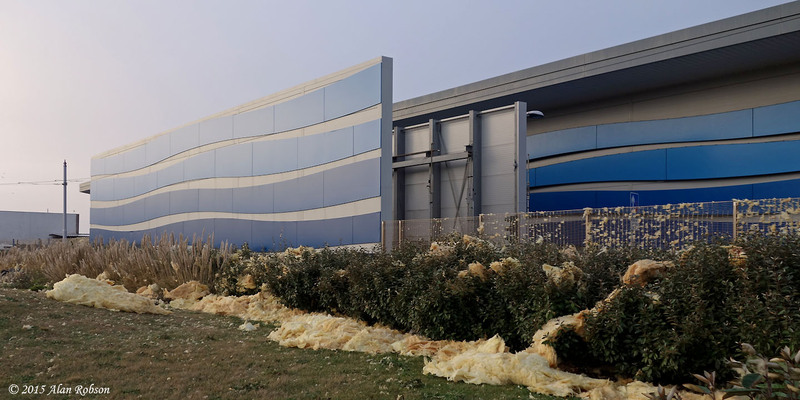 With the roof panels missing, vast volumes of fibreglass insulation were ripped out and blown all over the garden area and crazy golf course adjacent to the depot precincts. 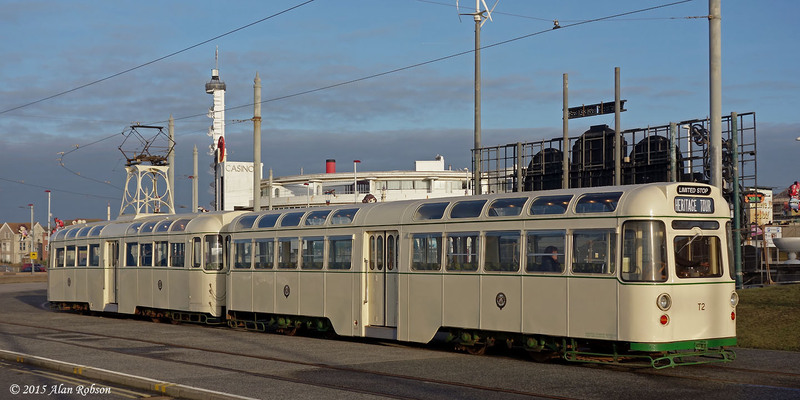 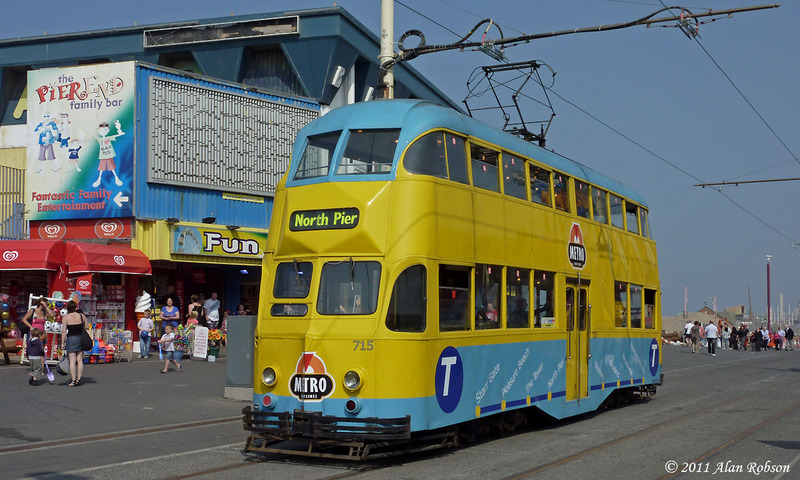 In view of the precarious state of the roof, the adjacent promenade roadway was closed for safety reasons, and the southern tram terminus moved north to the Pleasure Beach. 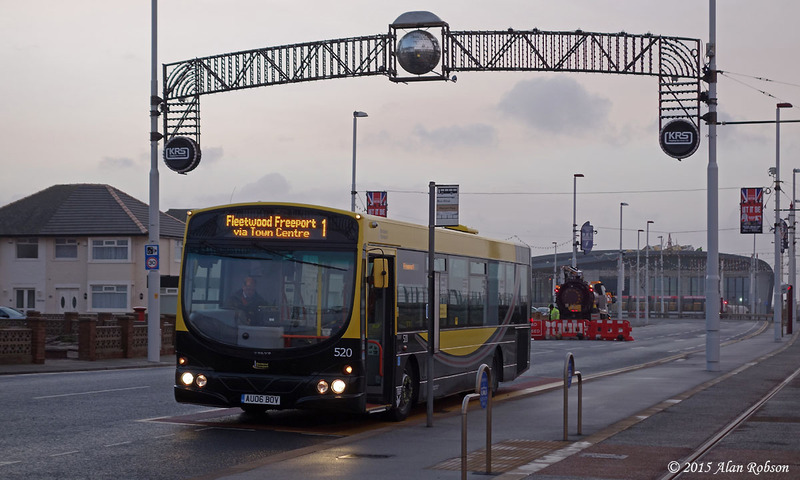 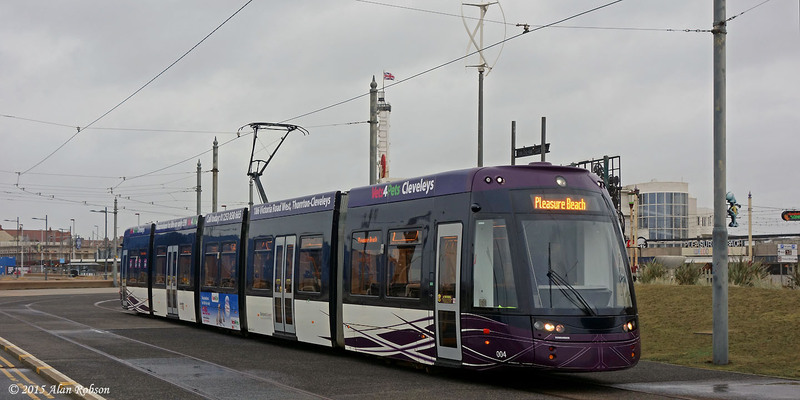 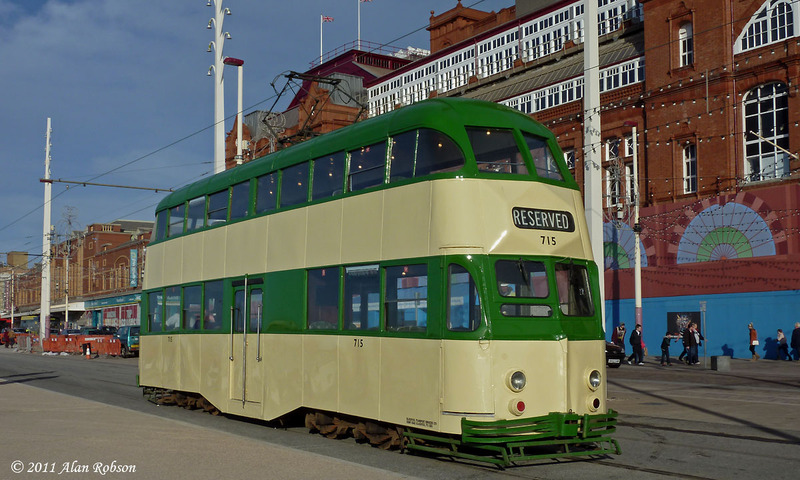 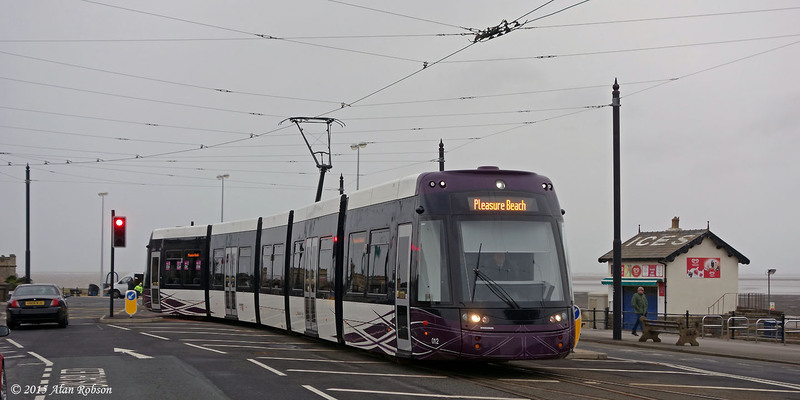 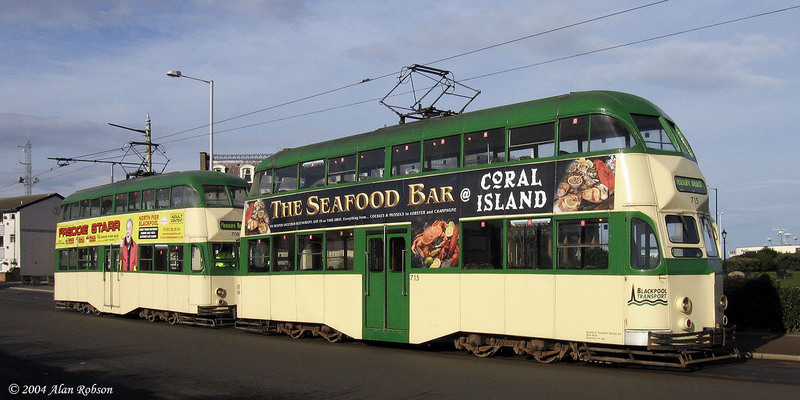 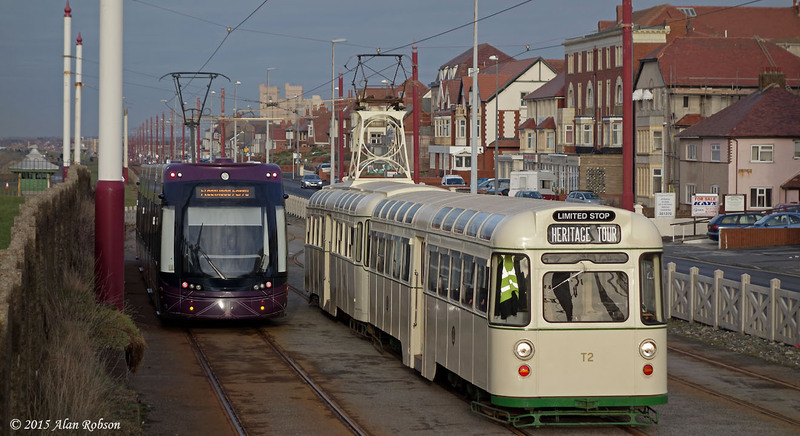 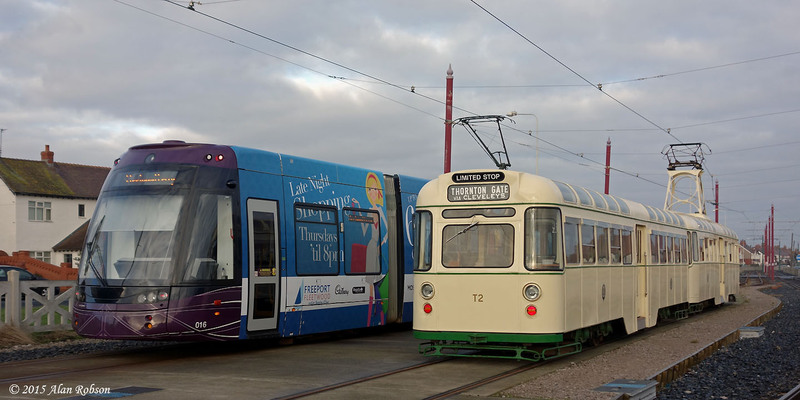 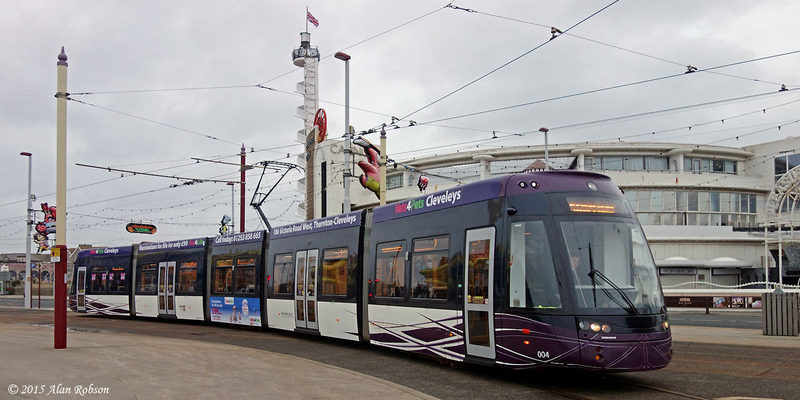 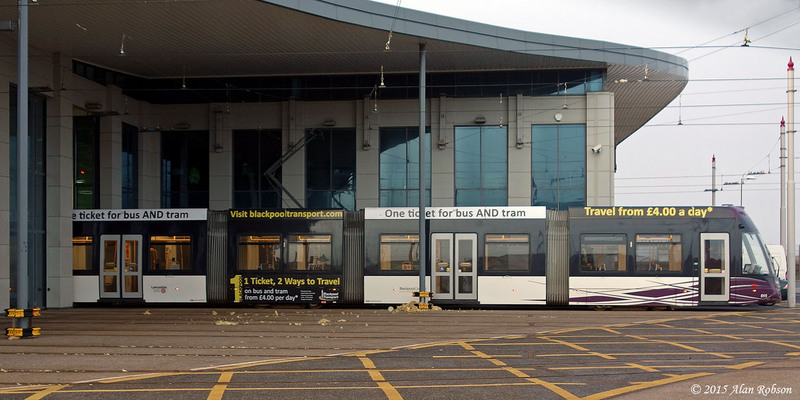 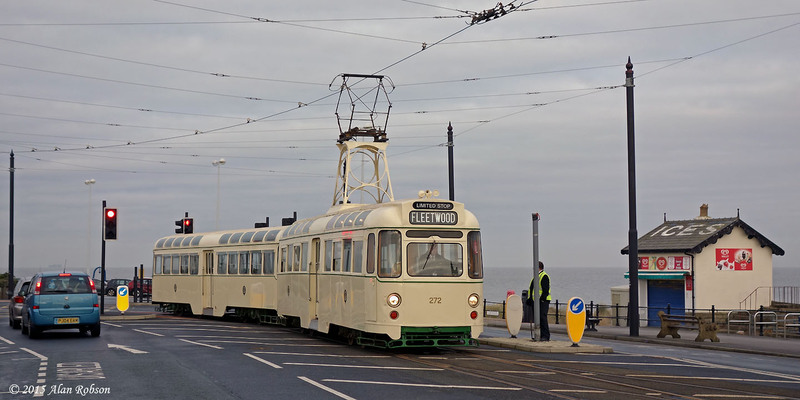 On Sunday 11th January the tram service was still only operating between the Pleasure Beach and Fleetwood Ferry, although all the Flexities were based at and operating from the depot at Starr Gate as normal. 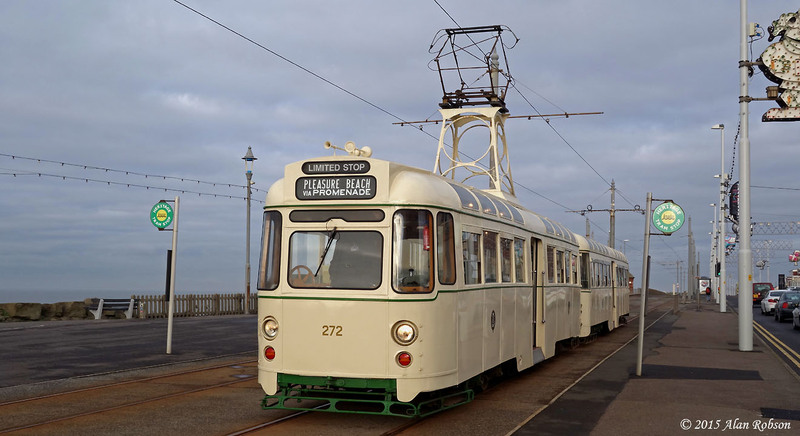 Heritage fleet Balloon 717 was in use on driver training on Monday 5th January and made a run right through to Fleetwood Ferry. 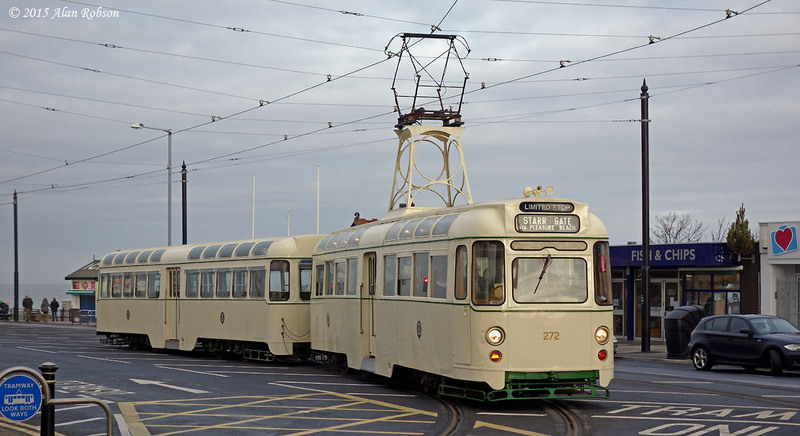 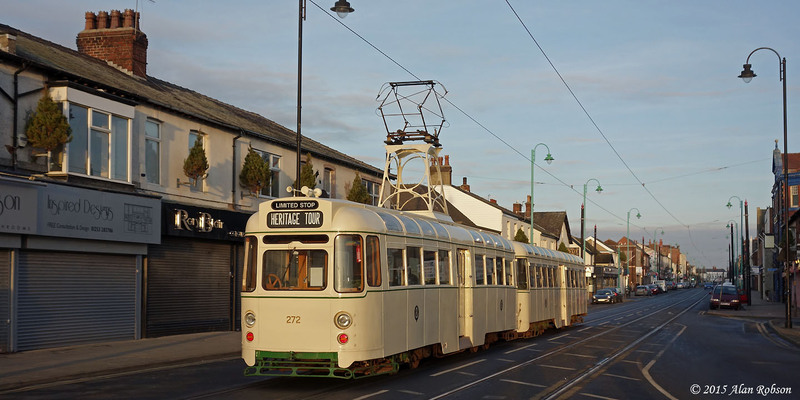 Twin Set 272+T2 was hired by a group of tram enthusiasts on Sunday 4th January. 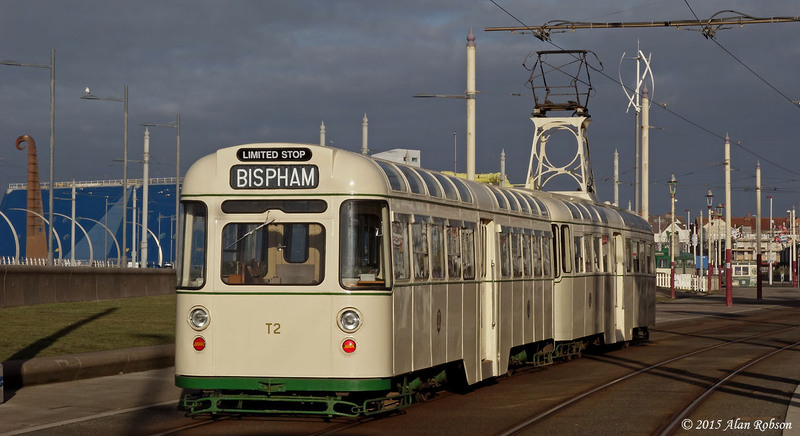 The tour covered the whole tram system from Starr Gate to Fleetwood, with two trips being made to the fishing port and a lunch break being taken at Bispham. 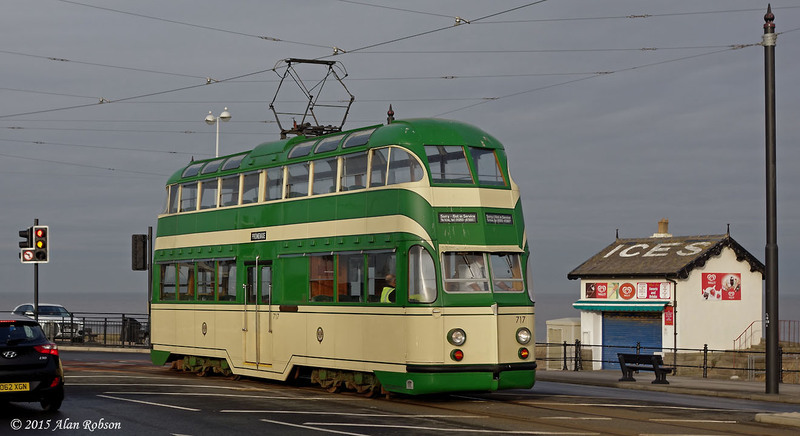 Since the Twin Set's last outing it has been fitted with a custom made set of brand new black and white destination blinds, which look much better on the heritage tram than the previous high visibility yellow on black blinds.